One of the most basic things in a library is the book shelving. Let’s go back to the late 19th Century for a look at shelving from that time period. This trade catalog from 1895 has a few examples. The catalog is titled Adjustable Book Shelving for Libraries and it is by A. B. & W. T. Westervelt. It illustrates different types of library shelving, designed and patented by George Stikeman. The illustrations include plans and elevations of the shelving. A. B. & W. T. Westervelt, New York, NY. Adjustable Book Shelving for Libraries, 1895, front cover. 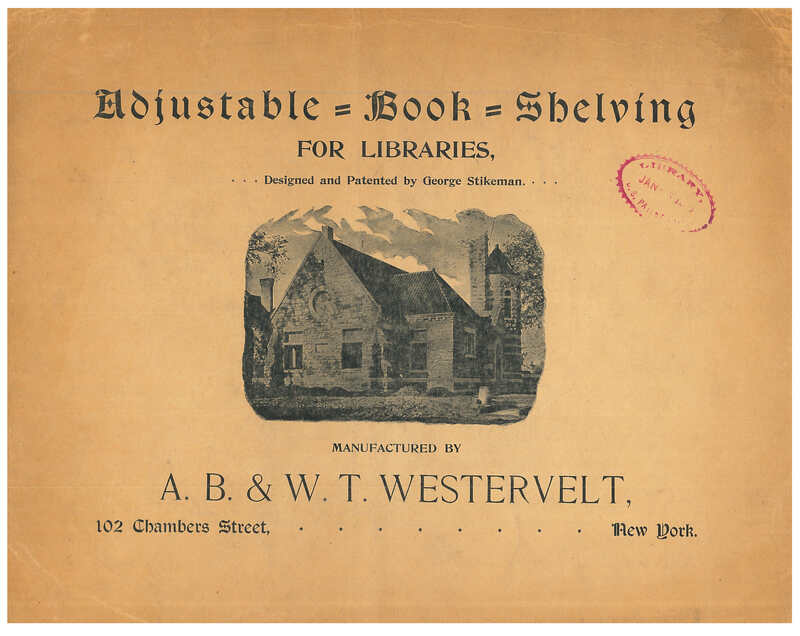 On one of the first pages, the catalog includes a list of “The Requisites of a Library Stack.” Many of the requirements listed, such as shelving for books of various sizes or shelving that is adjustable, removable and interchangeable, are easy to relate to even today in the 21st Century. There usually seems to be at least a few books that add to the challenge of shelving because of their large or irregular size, and adjustable shelving can make it easier to shelve. Illustrated below is an example of the Stikeman Patent Adjustable Book Shelving. 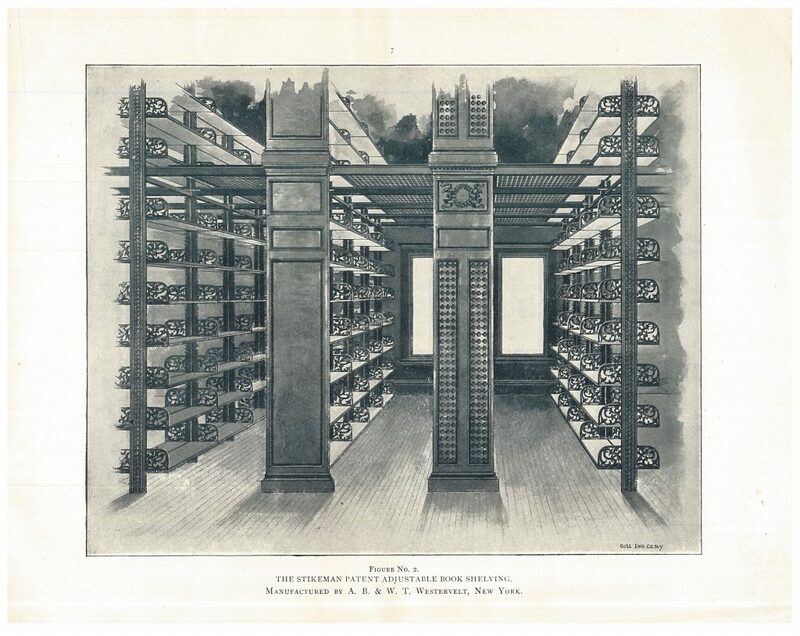 This illustration shows wall stacks which worked well when the stacks and reading room were combined in one room and patrons had unrestricted access. A. B. & W. T. Westervelt, New York, NY. Adjustable Book Shelving for Libraries, 1895, page 6, Stikeman Patent Adjustable Book Shelving, Wall Stacks. Another type of Stikeman Patent Adjustable Book Shelving is shown below. These shelves were double sided and the length of these stacks could be customized for the particular library’s needs. The ends of the stacks which face the aisle had either open brackets or decorative designs. A. B. & W. T. Westervelt, New York, NY. 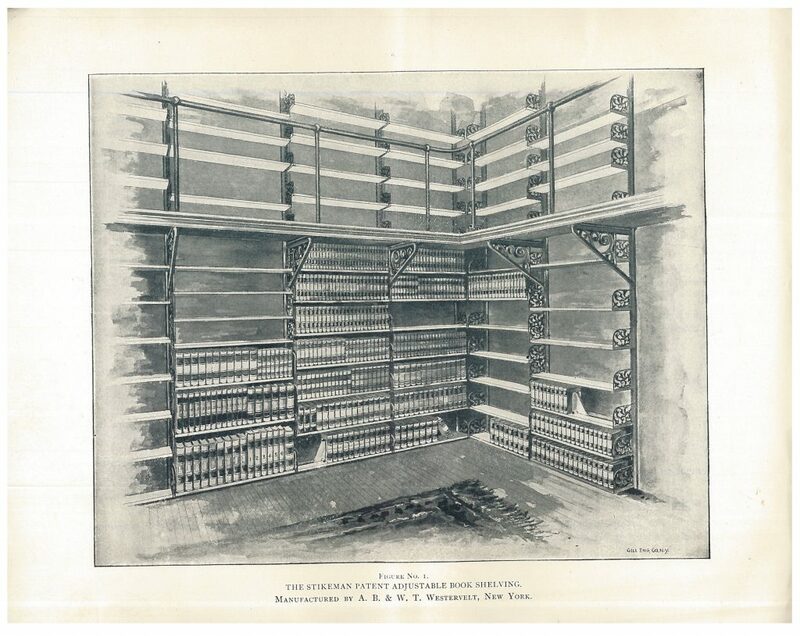 Adjustable Book Shelving for Libraries, 1895, page 7, Stikeman Patent Adjustable Book Shelving, double shelving stacks. Bookends or book supports to hold the books upright are just as important as the shelves in a library. 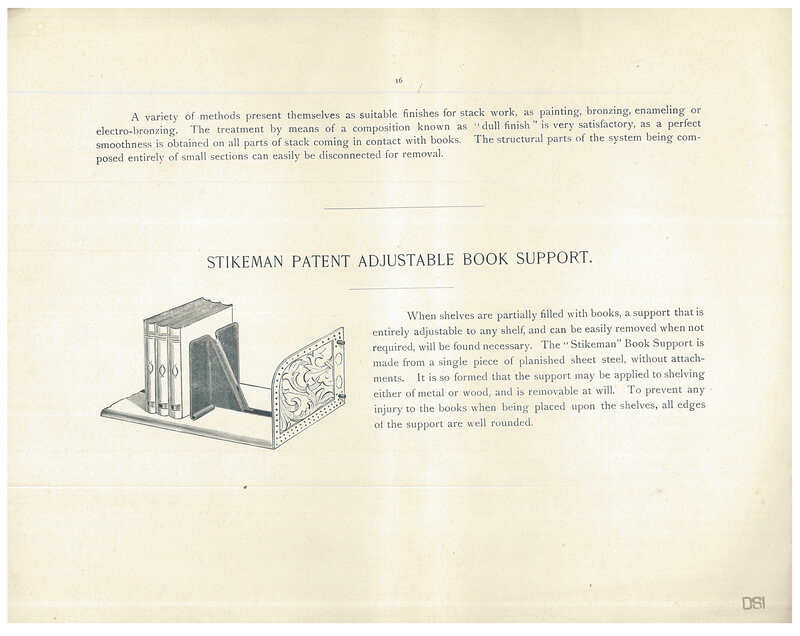 The Stikeman Patent Adjustable Book Support was made from planished sheet steel, was used with either wood or metal shelving, had rounded edges, and was removable. A. B. & W. T. Westervelt, New York, NY. Adjustable Book Shelving for Libraries, 1895, page 16, Stikeman Patent Adjustable Book Support. Adjustable Book Shelving for Libraries by A. B. & W. T. Westervelt is located in the Trade Literature Collection at the National Museum of American History Library.